I have read quite most of the books in the series and I had really enjoyed them so when I had found this book on Amazon I was very happy to read it and I must say that this book did not disappoint at all. It had the family theme that has been carried throughout the series as well as the sweet romance of reunited lovers. Jane's writing was flawless and she manages to make me fall in love with her well written characters. Trey's character was your typical protective male who loves his girl and his son beyond measure and I really enjoyed that his whole back story was given and that he was willing to become a better man. McKenna's character was a strong, independent single mom who was dealt more than her share of troubles and pain, but the fact that she was not going to let anyone separate a father and son is what I loved most. The chemistry between the two characters was good and I enjoyed seeing them as a family during the magical time of Christmas. 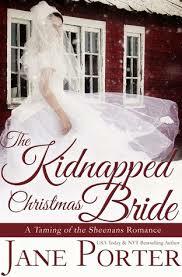 I would have liked a bit more drama in the book as well as to see her brothers and jilted grooms reaction to her being kidnapped. Overall this was a sweet and magical romance about a family reuniting during Christmas. Trey Sheenan has the the reputation of being Marietta's resident bad boy, until one day when things go horribly wrong and he loses his freedom, fiance and baby boy. McKenna Douglas has loved Try since they were teenagers, but when Trey is sent away for five years McKenna realizes she has had enough and sets out to do what is right for her son and herself which means moving on from Trey. When Trey is released early, he returns to Marietta to become the best father and husband but then he finds out that McKenna is getting married to another man in a candlelight Christmas wedding. Trey ends up risking everything again just to have one perfect Christmas with his family.